The Bear Gate was situated at the opposite end of Bear Street (sometimes referred to as Bear Lane), was one of seven gates around the Cathedral Close. 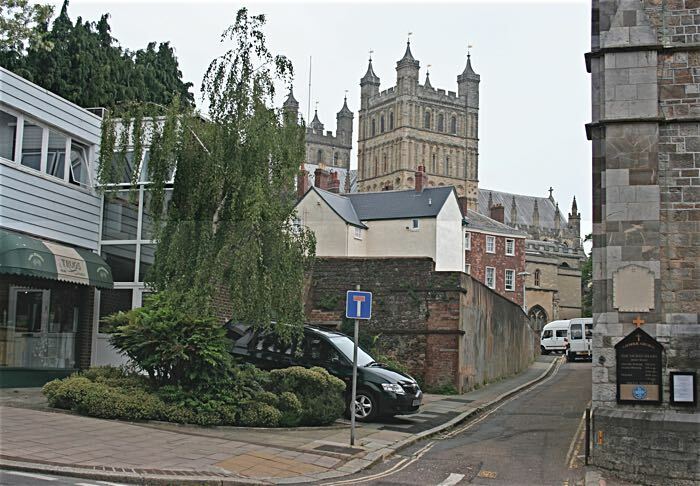 The Close was gated in 1286, after the murder of Walter Lechlade, on the 5 November 1283; this was so the Close could be closed at night to prevent strangers entering, and causing an incident. 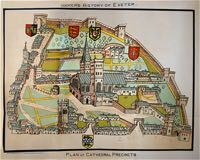 John Hoker recorded that the Bishop and Dean and Chapter agreed to erect seven gates around Cathedral Yard, and including a small gate in Bear Street. The gate had a simple pitched roof before a chamber was added over, by 1584, for Mr Barcombe paid two pence per year in consideration of "his new building over the gate going into the churchyard by the said Bear Gate". Access to the chamber was through a door from the Bear House, presumably the the building on one right side of the gate. The small chamber was leased to succession of tenants. In March 1625, Nicholas Strawe, was given permission to build stairs from Mr Chanter's house into the chamber over the gate "so as it be not prejudicial to Mr Chanter's lights". The existing access to the chamber from the Bear House was to be blocked. Richard Dewdney leased the chamber over the gate and the Royal Oak messuage in St Georges for many years. He appears to have sublet the chamber over the gate for in 1696 poor relief was granted to Goody Day, a poor woman living in the Bear Gate. By 1718, Dewdney's son, Nathaniel Dewdney was granted a new lease. The lease of the chamber passed to his widow in 1753, until 1764 when it was relet in March 1764. In 1812, the Cathedral decided to remove the chamber over Bear Gate "leaving a Gateway of the same breadth and height as at present and to be shut as usual." The gates were also to be removed and temporary posts and chain installed to prevent passage through the gate "for the usual hours at night as often as the Chapter shall think fit...and at least on Midsummer Day in every year." By the next year, Robert Cornish surveyed the gates around the Close and concluded that Bear Gate should be totally removed and replaced with an iron gate. It was demolished in the Spring of 1813 and Thomas Matthews paid the sum of £10 for taking down and repairing the sides. He was allowed to remove the salvaged material for his own use. 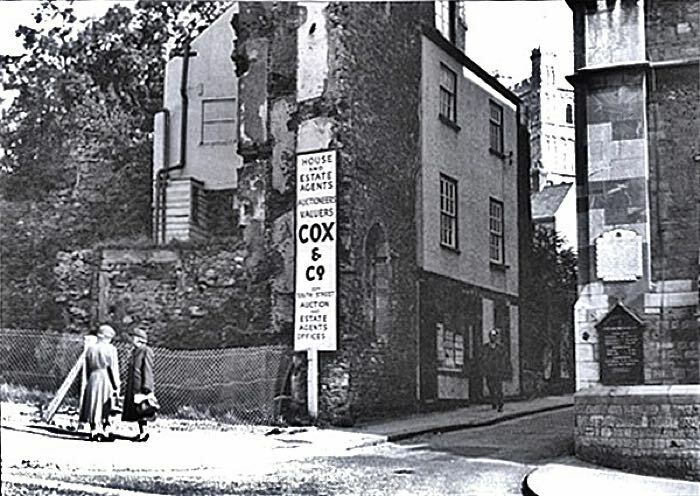 All the buildings on the northern side of Bear Street at the Cathedral Yard end, were demolished in the 1930's. 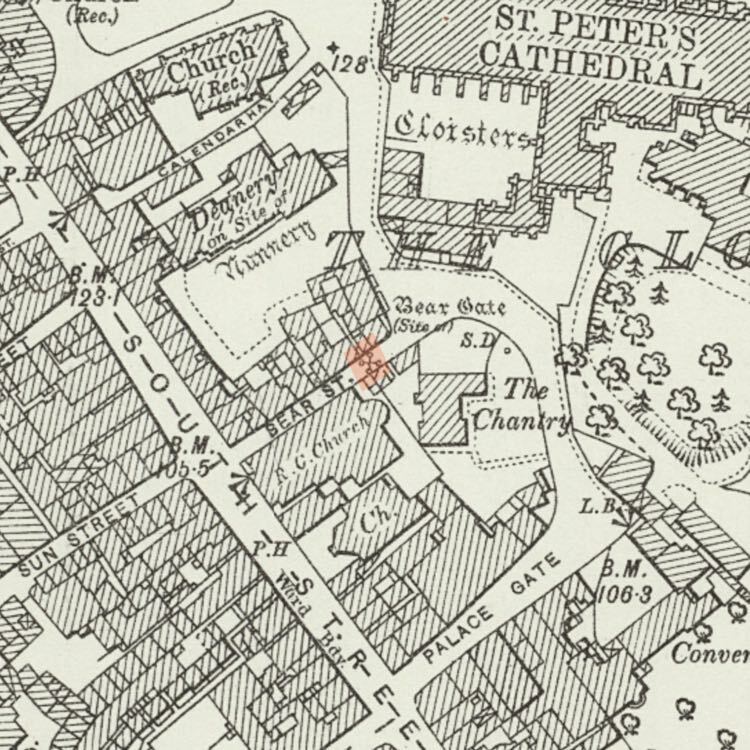 The Catholic Church of the Sacred Heart situated in South Street replaced the old Bear Inn in 1885. On the opposite corner can be found a tree and shrubs, marking the site of the 14th Century Bear Tower. It was exposed when buildings around it were destroyed in the blitz, only to be demolished in January 1966. The tower was probably 30ft high, and constructed from the local purple volcanic trap. 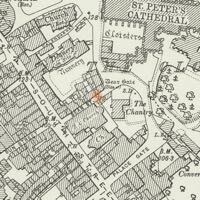 Jenkins wrote of the tower "The opposite corner of Bear Lane bears evident marks of antiquity. According to tradition it was a Nunnery", although no other reference to its existence has been found. The was a Gothic doorway onto Bear Street. 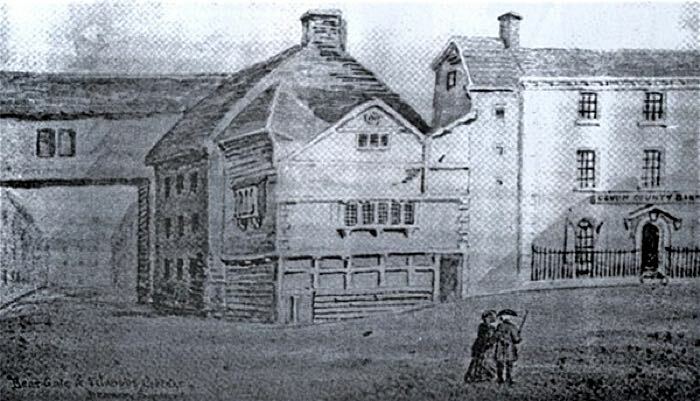 The illustration of the Bear Inn shows the tower in the mid 19th Century. Bear Street showing the garden site of the Bear Tower. The Bear Gate appears to have been a square structure. Looking towards South Street. 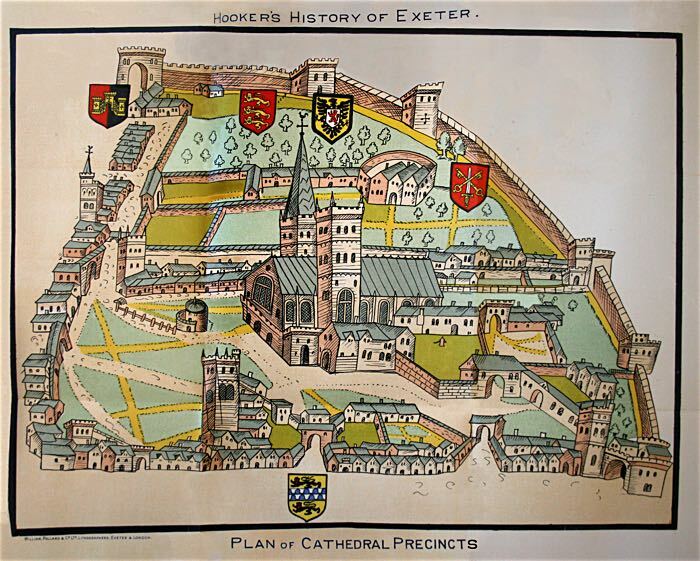 Hookers map of Cathedral Yard. Bear Gate is immediately above the coat of arms at the bottom of the image. The Bear Tower, centre, before it was demolished.